Vivien felt a little gauche when she spied Diana thumbing through an issue of La Belle Assemblee’ in my debut Regency novel Notorious Vow. This popular magazine from the Regency period contained a plate featuring the viscountess wearing a striking Turkish cape. Diana had beautiful titian-colored hair, and so the deep red color of this cape merely accented her well-known feature. If Cotillion does not positively make you scream in delight, you have my leave to remonstrate with me in the comments below. But I warn you! I am devoted to Ms. Heyer and her work. This entry was posted in Notorious Vow, Regency and tagged La Belle Assemblee by Angelyn. Bookmark the permalink. I love the muff in the picture……reminds me of gr grandmother’s lamb muff. I went to the website cited in the article and noted that “pelisse” is a wrap. Interesting in that today “pelisse” is a very light fabric for summer clothing. 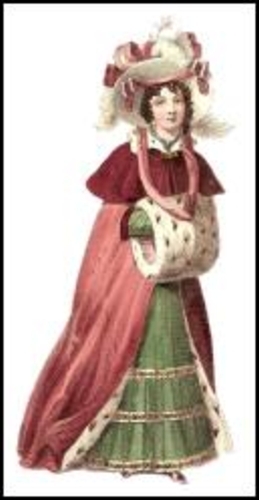 Enjoyed the Regency information on clothing.